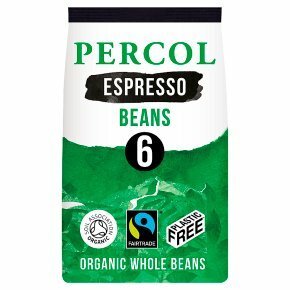 Strong, dark roasted beans with hints of toffee, bitter chocolate, and a sweet nutty after taste. A rich roast that yields a full flavoured, smooth coffee with a great crema. Percol's charitable foundation 'Good for Life Charity' raises money to support mothers and children through healthcare, education and microcredit projects in third world communities. Fairtrade. Organic. Coffee on a mission. Plastic free. Strong - 6. Climate Neutral Company - First Climate Certified. Origin: Central American and Indian Roast: Dark Roast Taste: Dark Chocolate and Spice Coffee This coffee is organic, picked by hand, and freshly roasted in the UK. When you care, you do it properly. Grind, then brew the perfect Cafetière Coffee 2 tablespoons (15g) per 250ml cup. Add water just off the boil. Stir, then brew for 4 minutes. Plunge, pour and enjoy.